She is 26 years old and her husband Jeff was 31 when he died the result of injuries he suffered while serving in Iraq. Jeff left for Iraq in October 2005. Along with so many other families in the area, Jenny said goodbye to her husband at the air base in Lincoln, Neb. As a Cavalry scout, his job in Iraq was to go ahead of troops or units of soldiers to secure an area for others to follow. The job was dangerous and this time, Jenny knew her husband was using his experience as a police officer on a much larger scale than anything he had ever known back home in Nebraska. One of Jeff’s duties in Iraq was protecting a specific canal. One night last August, he and three other soldiers drove their Humvee alongside the canal during a fierce sand storm. Suddenly, their vehicle hit a large sinkhole and the Humvee flipped over, pinning the soldiers under water. Jeff Hansen normally rode in the front of the vehicle, but when he was pulled from the water, he was in the rear of the Humvee where the other soldiers normally rode. The three other soldiers were rescued, which the U.S. Army believed were likely freed by the Nebraskan. Jeff was eventually airlifted from the accident scene, but that evacuation was hampered by the raging sand storm. â€œThey resuscitated him, but they couldn’t save him,â€ said Jenny. Jenny boarded the plane to Germany, not really knowing what she would find. She rode alongside her mother, Becky Deines, and Jeff’s father, Bob Hansen. Jeff’s mother had succumbed to cancer two months earlier, so the members of the two families clung to each other as they crossed the Atlantic, hoping for the best and dreading the worst. But in that hospital room, the soldier’s bride and former NCAA Division II All-American golfer, came to a sudden crossroads in her young life. Gone were those easy days of dogs barking across whispering cornfields or shouts of touchdown triumphs for the home team. Gone was the laughter and the kiss at the fountain. Gone was the uncomplicated innocence of small-town America. This was Germany, miles from home. This was war. This was the most unbelievable circumstance she could ever imagine. And now, at age 26, she was being forced to make the biggest decision in her life. Jeff Hansen, at age 31, had made the ultimate sacrifice. And as she stared across the hospital bed at the man with whom she had planned to spend the rest of her life, Jenny knew that her husband would never really come home. The breathing ventilator was turned off. The family huddled together. An hour later, Jeff Hansen was gone. â€œIt was like he was waiting for it to be OK,â€ Jenny said. Four days later, Jeff Hansen was buried with military honors at the Lutheran Church in Minden, Neb. A group called â€œThe Patriot Guardâ€ escorted the family to the burial services, keeping their roaring motorcycles between the family and anti-war protestors. It was surreal. It was numbing. It was something for which she could never have been prepared. And then a letter arrived at Jenny’s home. It was from Jeff. Weeks earlier, she had asked her husband what he thought about her trying to play golf professionally. She wanted to test herself and see if she had what it took to compete on the next level. Jeff had written to his wife to say that he was glad she had refocused on golf. The timing of the letter was uncanny. He was gone, but his words of support were as strong as ever as she struggled with what her future held. Jenny is so far 0 for 2 in cuts made on the Futures tour. She certainly has a big fan in heaven right now. God bless Jenny(and good luck also) and all the Iraq and Afghan war widows. Last Memorial Day, Jenny Hansen went through the motions of celebrating the national holiday just as many other Americans do every year. There were flags, fireworks, ice cream and neighborhood cookouts for the official kickoff to summer. And in her hometown in Cairo, Neb., a town of nearly 750 residents, everybody knew the ones who had served their country and the ones who were now serving overseas. So many thoughts raced through her mind as she stood amid the clanging hustle of the busy restaurant, clutching the telephone that had just delivered words too potent to completely process. She pondered the weight of the words and the nature of the accident. She thought of her husband waiting for her in a hospital bed, far from the homey comforts of Nebraska. Jeff Hansen was a police officer in Kearney while Jenny was a college student. They had met at a college football game and hit it off. Jeff later asked Jenny if she’d like to go for a walk. The two had their first kiss at the fountain on campus. When Jeff proposed to Jenny during her senior year of college, it was on the 18th green after the final round of the 2002 NCAA Division II Women’s Golf Championship in Grand Rapids, Mich. But two weeks after the 9/11 attacks in 2002, the National Guard called him to serve in Germany as support for U.S. troops. Jeff asked if his deployment could be delayed. Jenny and Jeff were married on October 12, 2002, and he was deployed two days later on October 14th. Jeff was sent to Bosnia, where he served for 10 months. He consoled his new bride and told her it was â€œnot a big deal,â€ and that everything would be fine. 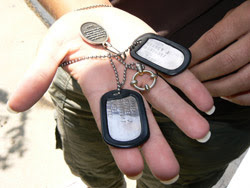 When he returned home to Nebraska, he became a federal police officer and went to work at the local veteran’s hospital. But the next thing was a new request by the U.S. Government. Jeff left for Iraq in October 2005. Along with so many other families in the area, Jenny said goodbye to her husband at the air base in Lincoln, Neb. As chance would have it, Hansen traveled to the U.S. Women’s Mid-Amateur Championship last October, where she met teaching professional and former LPGA Tour member Sue Ertl. Ertl was moved by the Nebraskan’s personal story and her determination to begin taking bold new steps in her life. 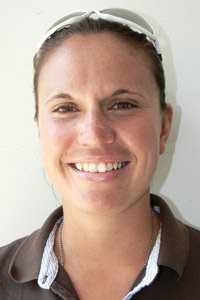 Ertl began working with Hansen as her golf instructor. What’s next for Hansen took her out of Nebraska. She earned playing status last November at the Duramed FUTURES Tour’s Qualifying Tournament and moved to Florida to live with an aunt so she could practice and compete during the winter months. Hansen turned professional in January this year. She has gotten into tournament fields twice this season on the Duramed FUTURES Tour, missing the cut in both, but walking away with the assurance that this is a personal challenge she must attempt. Hansen knows that being successful on the Tour is a long way from her days as the individual champion of the 2002 Rocky Mountain Athletic Conference and the 2002 NCAA Division II Western Regional Championship. She knows there is much to learn as a new pro. And she recognizes that there are still plenty of days when she longs for a life untouched by war and unmarred by heartbreak. 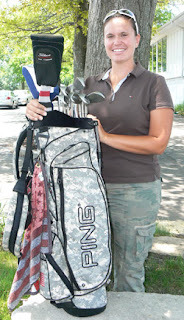 Hansen wears her husband’s military identification â€œdog tagsâ€ underneath her golf shirts and carries a Ping golf bag that has a digital military print on it. She has received some 3,000 letters, 20 handmade quilts and a gaggle of crocheted angels and butterflies from supportive military families and individuals around the nation. She appreciates each gesture and knows the last nine months would have been even more difficult without the help of others.